We already decided the suspension on our Best Sport-Tourer of 2018 was the best ever on a Kawasaki (and almost best-ever, period), but that didn’t stop Kawasaki from adding electronic suspenders (KECS) to its new H2 SX SE+, along with a few other epicurean upgrades to make its highly advanced class-of-one supercharged sport-tourer stand even further apart from, and ahead of, the crowd. Holy Kaw. 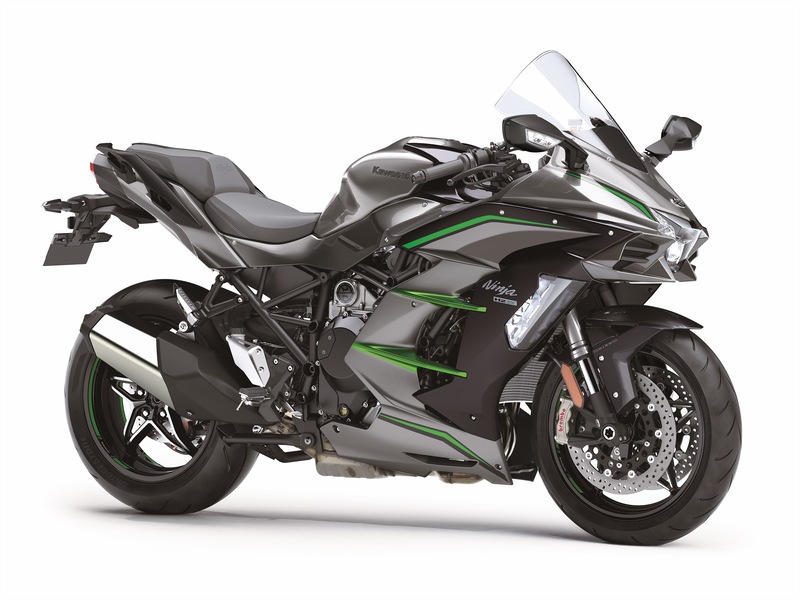 Read more about 2019 Kawasaki H2 SX SE+ First Look at Motorcycle.com. Last edited by YSR50; 11-06-2018 at 02:12 PM. An H2 SX SE + ??? Hmmmm I see this as an odd strategy. I’d love to know why Kawasaki decided to go all out with an SE + edition with. USD price tag 3k higher than last year! 25k is a crazy price tag. I thought the SE at 22k was rough. Even the H2 Carbon didn’t see a price increase that large and the upgrades seem more substantial. Did they sell that well? Maybe the SE Edition did well enough that making a base model wasn’t worth it. I'm not really liking the decals on that bike.Somehow it seems to cheapen the look...??? ?The paint is very nice.The one I rode was okay...not 25K worth okay though. (the first version). Last edited by h2madness! ; 11-07-2018 at 06:29 PM. I don't mean to say anything bad about the SE as far as styling it looks pretty good to me. BUT when you compare it to an H2 there is a huge difference in the detail and the finish. There is one in the dealership here and I was waiting around and spent a lot of time just looking at it. The quality is good but it isn't a H2. Things are just not as high and tight.. When the first H2 was released I remember reading and hearing about people wanting to see what a sport touring version would feel like. You are right though. The H2 SX definitely does not have the same feel and presence that the H2 is meant to. But...Maybe it’s not supposed to and we are comparing it to something we shouldn’t. I am curious to see what the future holds for the Zx-14. Again, I know it’s a totally different bike than the H2 SX but when I had my 12’ Zx-14 that bike was a touring machine. Zig zagged across the country plenty of time. Anyone think there’s is a possibility that the SX might evolve to a point where it squeezes the Zx14 out of the picture? It's possible.But the 14 is STILL a draggers machine.Lots of options for the 14.